This new collection includes ZARKORR! THE INVADER, KRAA! THE SEA MONSTER, and MONSTERS GONE WILD! All three DVDs come together in a special, space-saving slimline DVD case. Intelligent aliens who have been studying Earth for centuries decide to challenge mankind by sending in a 185-foot, laser-eyed monster to wreak city-crushing havoc.... A coalition of highly intelligent alien beings is about to put our entire civilization to the ultimate test - and they have selected one incredibly average young man, postal worker TOMMY WARD as the planet's sole defender. His opponent, 185 feet tall, 300 tons, equipped with deadly eye lasers and a nasty disposition, ZARKORR! is a city crushing "monster-on-a-mission" and no weapon on Earth can harm it. Armed with only a few vague clues given to him by the PROCTOR (a five-inch tall, beautiful female hologram), Tommy alone is the only Tommy can find the beast's weakness and save the planet--with a little help from a 5-inch-tall female hologram. 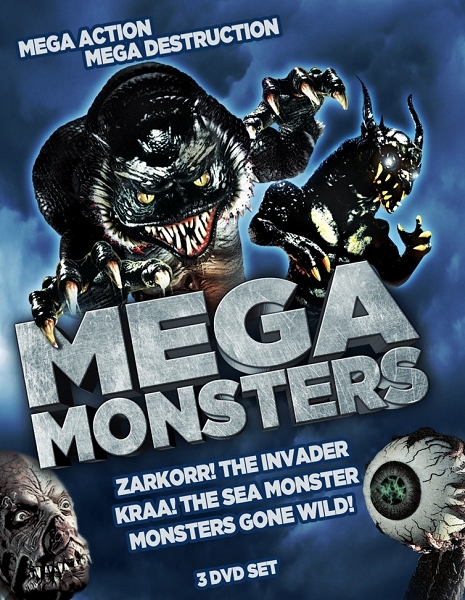 Over 250 feet long from tip to tail, the massive sea creature, KRAA!, has been sent to destroy all life on Earth and claim the "Warm Planet" in the name of the evil Lord Doom. The only hope of survival now rests with THE PLANET PATROL; four powerful young intergalactic crime fighters. Over 3 hours of monsters, vampires, creatures, ghouls and more. From classic monster kills, to slashers, to damsels in distress, to wizards and creatures from other dimensions. There is never a dull moment in this high-energy compilation of over 18 Full Moon films. Packed with extra features including over 90 minutes of RARE Behind the Scenes footage! Plus a bonus exclusive interview with comic book legend JACK KIRBY! !